Conforms to EN397 Traditional 6-point polyethylene harness. Egyptian cotton core with p..
•Conforms to EN397 •Traditional 6-point polyethylene harness. •Egyptian cotton core with porous PU..
Easy to attach and detach with spring loaded arms that give an excellent fit to the ear. When n..
SNR 26 Low attenuation small cup 80-107 DB Moderate industrial noise Workshops Printing w..
Elastic chin strap releases automatically with forces between 150 and 250 Newtons. Fits EVO2, E..
•In tests the EVO3™ proved far tougher than the EN397 standard required and far tougher than any of .. In tests the EVO3™ proved far tougher than the EN397 standard required and far tougher than any o.. 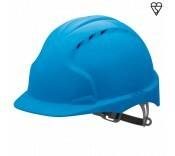 The JSP MK7® safety helmet is the ultimate in EN 397 head protection. Years of research and dev.. Suspension system and shell structure suitable for industrial, mountaineering, rescue and leisure..